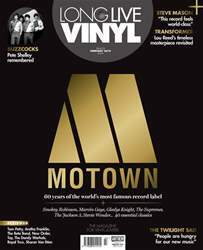 Berry Gordy, Stevie Wonder, Marvin Gaye, Martha Reeves, Smokey Robinson, Lionel Richie, The Supremes… over 180 No.1 singles worldwide… In issue 23 of Long Live Vinyl we celebrate 60 years of the world’s most famous record label as Gareth Murphy tells the inside story of Motown. We also round up the 40 essential Motown 45s that every collector should own. Elsewhere this issue, we pay tribute to Pete Shelley in one of the Buzzcocks frontman’s final interviews; Steve Mason tells us about his “world class” new album and we find out why The Cure’s Robert Smith has tipped The Twilight Sad as one of the best new bands on the planet. We also take an in-depth look at the album that lifted Lou Reed out of obscurity – 1972 masterpiece Transformer, meet the artistic geniuses behind The Designers Republic, visit Union Music and go cratedigging in Glasgow. If all that’s not enough, check out our newly expanded reviews section, where you’ll find the widest range of new albums, reissues and hardware anywhere!